In the past decade, more and more people have been installing UV lights in their HVAC systems to eradicate harmful bacteria. A timely study from Duke University Medical Center has proven the effectiveness of using UVC bands to disinfect a myriad of dangerous microbes, including drug-resistant bacteria, such as Acinetobacter, Clostridium difficile and vancomycin-resistant enterococci (VRE). During the research, scientists concluded that UV light (specifically, UVC), if properly applied, can remove up to 97 percent of bacteria in HVAC systems. In residential settings, the application of UV fixtures is a straightforward process, due to the non-hazardous nature of mainstream living spaces. But in commercial and industrial sectors, there are several hazards that must be taken into consideration when installing UV lighting in HVAC systems. For example, failing to install explosion proof luminaries with Class II, Division 1 and 2 ratings in grain storage silos could endanger workers in the facility. There are several ways to install UV lights in HVAC systems. In all of the disinfection methods, the lamp must come in direct contact with the air. This is the only way the light can effectively inactivate germs, molds and bacteria lurking in the environment. Because carryover treatment does not occur after contact, most individuals install the fixtures in exposed areas of the HVAC system. 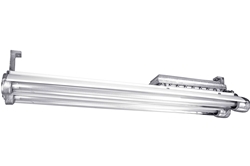 When installing UV lamps over the air handler coil (called coil sterilization treatment), a long, tube-shaped UV light is placed at the return air duct. The air handler coil is responsible for regulating and circulating air within the system. Without taking ignitable substances into consideration, this is an ideal place to install the lamps due to maximum exposure to air. In UV air sterilization, the UV lamp is installed over the air handler blower. This component moves the air through the HVAC system at controlled speeds, using a fan. This is also a suitable location for UV fixtures, because the air is moving at a constant rate (low-velocity air is optimal for UV treatment). As mentioned earlier, in unclassified locations, like commercial office buildings, schools and residential homes, technicians could maximize lamp exposure without taking explosive hazards into consideration. In a potentially explosive environment, where ignitable compounds are present in the air, operating an unclassified luminary is not recommended. Although an HVAC system filters the air to get rid of volatile, gaseous substances, the process is not 100 percent effective. Because of this, explosion proof UV lights must be installed in the HVAC system. The type of explosion proof UV fixtures needed in the HVAC system can be determined by the type of combustible substances present in the facility. Class I, Division 1 and 2 explosion proof lights are typically found in locations that handle concentrations of unstable gases or liquids that produce large amounts of ignitable vapors, such as petrol, gasoline and paint. Examples of industrial facilities that require Class I, Division 1 and 2 rated lights include the following: petrol processing plants, paint spray booths and major repair garages. Class II, Division 1 and 2 rated fixtures are specifically designed for hazardous work areas that handle or process potentially ignitable dust, such as corn starch, plastic, coal and aluminum (metallic dust). The compounds are easily combustible, especially in the air. In compact mass form, such components are still considered to be dangerous. Examples of industrial facilities that require Class II, Division 1 and 2 rated lights include grain silos, commercial alloy processing plants, and chemical storage buildings. Class III, Division 1 and 2 luminaries can be found in hazardous work locations that deal with explosive fibers, such as cotton, hemp, Spanish moss and rayon. Woodworking facilities, clothing manufacturing plants and textile mills are examples of industrial settings where the fixture are applicable. For HVAC technicians, it is essential to match the ratings of the explosion proof UV light with the respective location. Moreover, for a thorough approach to mitigating risks associated with working in hazardous locations, businesses may use other explosion proof equipment that support HVAC systems, such as explosion proof thermostats, plugs, extension cords and fans. Installing explosion proof UV lights in every corner of the HVAC system is not recommended, due to limited space; and from a long-term perspective, operating numerous high-powered lamps can be costly. In order to get the most out of Ultraviolet Germicidal Irradiation (UVGI) treatment, one must carefully choose sections of the system where bacteria thrive. One of these locations is the evaporator coil. Some individuals claim that installing a UV lamp over this component prevents the physical buildup of bacteria, making the coil look brand new. In application, it is best practice to mount the luminaries roughly 36 inches from the evaporator coil. Furthermore, it is also important to check the operating temperature thresholds of the lamp, as temperatures in the HVAC system are usually significantly colder, compared to conditions inside the building. Operating a fixture in temperatures below its standard operating threshold could lead to premature failure or malfunction. Because water molecules are known to absorb UV bands, it is crucial to increase the number of UV fixtures in the HVAC system, if relative humidity values surpass 60 percent. One should also consider that exposing cheap, low-quality HVAC parts to UV light can decrease the lifespan of the components (not the lamp). This is because UV light has intrusive capabilities that can breakdown organic substances that are exposed to the beam for long periods of time. For the accumulation of molds on windows near vents, it is advisable to install UV lamps inside the ventilation system, close to the exit (without letting the light escape the vent). This can help decrease the frequency of cleaning mold buildup and residue on windows and nearby equipment. Lastly, UVGI lamps should never be installed below the upper part of the facility, as it could expose workers to harmful UV rays. To encourage air circulation between the breathing zone and irradiated zone, fans may be strategically installed around the facility.